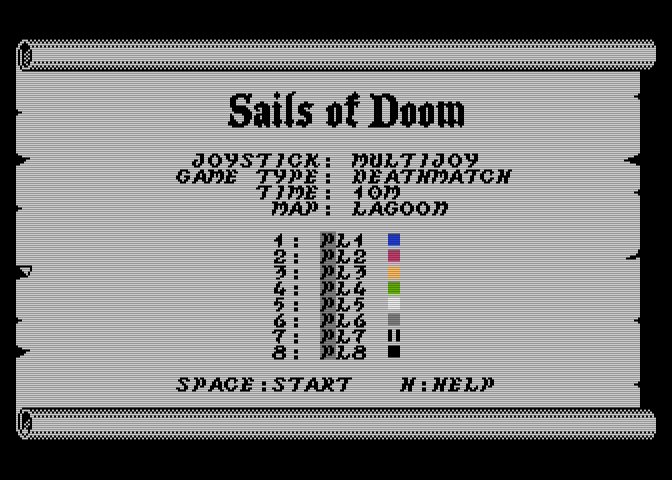 Finally I can announce my new multijoy game, Sails of Doom, is finished. 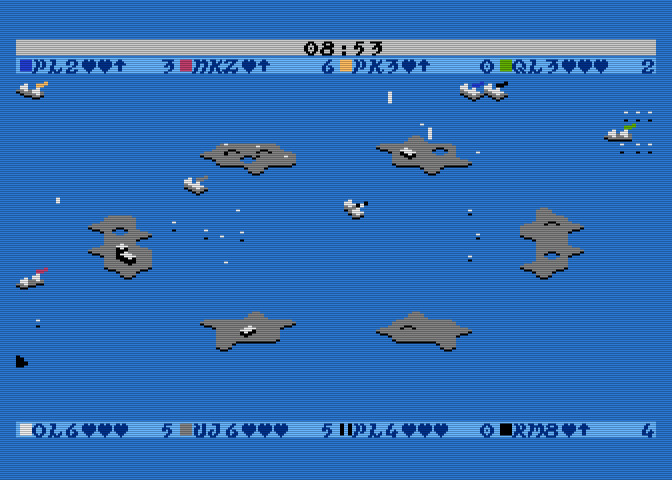 It was released on FLOP62, discmag of Atariklub.cz. Here I want to show you the game itself, and answer any questions. Basically it's a multijoy game for 2-8 players. You control small ship, and shoot other players. There is detailed guide on FLOP62. The game does support NTSC. It is also playable in 2 players without multijoy, but it's quite watered-down experience. For the proper mayhem get 8 players. Nice job. It looks like a neat little game. I haven't played against any opponents yet; but the graphics and animations look cool, and the game mechanics are good. I appreciate the NTSC accommodations. Edited by MrFish, Mon Oct 15, 2018 10:16 AM. Thanks for the great game. We had a lot of fun playing at Fujiama. Where is it possible to buy a multijoy? ivop sold very nice bare boards a year and a half ago, even though they require a lot of soldering I'd say they are rather simple to build. No one seems to sell finished ones even semi-commercially. Would be a nice candidate for Lotharek. Couldn't afford one if Lotherik produced it hopefully some one else will. Might bring that idea up on our club meeting. I think we have some boards lying around .. maybe one of the boys can assemble one or two .. But then we like our circuits naked, we have no solution for the box, AFAIK .. will come back about the issue on Friday .. It looks really cool, unfortunately I'm a lone Atari gamer, not even a second person for two player games...I've no use for a multi-joy for this reason, too bad to, as there seem to be quite a few good looking multi-joy games coming out. Sadly this was designed as party game from the start. I was thinking about some single player content, but in the end I mostly run out of RAM. As I need to draw 8 players, I use pre-scrolled gfx data, which is pretty memory hungry. Edited by Mathy, Mon Oct 15, 2018 5:47 PM. Well, krupkaj is regular member of our meetings, and this modular model is indeed the hot stuff. Still the problem with the case remains. Edited by R0ger, Mon Oct 15, 2018 6:59 PM. IIRC, this is krupkaj's version. It does not need a case as it is sandwitched between to pieces of clear plastic. Yes, this is the 'old' non-modular version. I've never actually seen one like this. Most people just leave them naked, and I've seen one boxed. I guess this could be done even with the new modular one .. or basically any board. I have seen one like this and it looked good when it was new. Unfortunately, the acrylic (or whatever material it is) boards are prone to cracking around the screw holes so they may eventually fall off. A more flexible material would be a better choice. It has no effect on the functionality though, and the boards are sturdy enough even without a case. plastic washers alleviate the problem to a degree. I am not sure how many PCBs for MultiJoy Zdenek has home. I think there are 2 or 3 which could be finished soon. If there is demand we could order next 10 or 20 boards. Just write here if you really want one. A funny task would be to modify some games originally designed for MultiJoy and XL/XE to work with the old rugged 4-port Atari 800. 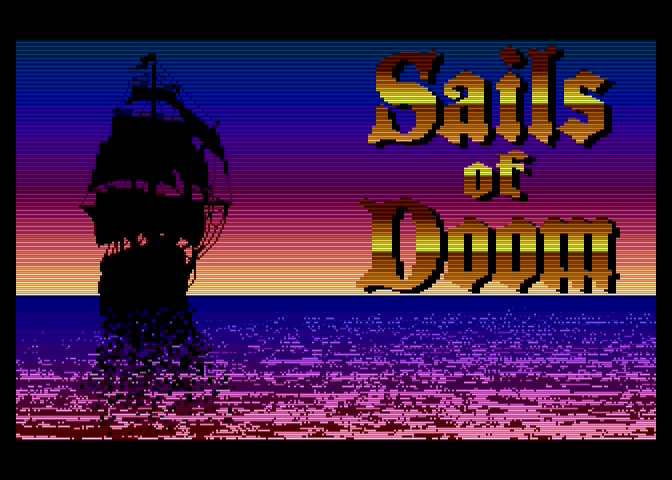 Sails of Doom is probably not a very good candidate, as RAM under ROM is used, right? Edited by baktra, Tue Oct 16, 2018 7:09 AM. Yes, all RAM is used. When playing the game against 6 players, I almost felt like this. Edited by baktra, Tue Oct 16, 2018 8:16 AM. Do we have an emulator that does NetPlay? That could be fun. I would be interested in 1 as well.